Some movement, but no crisis. After a pretty fallow first quarter of 2018, there has been a lot of interest in polls over the last couple of weeks, sparked by a shock Kantar poll that had PiS down by 12 percentage points. 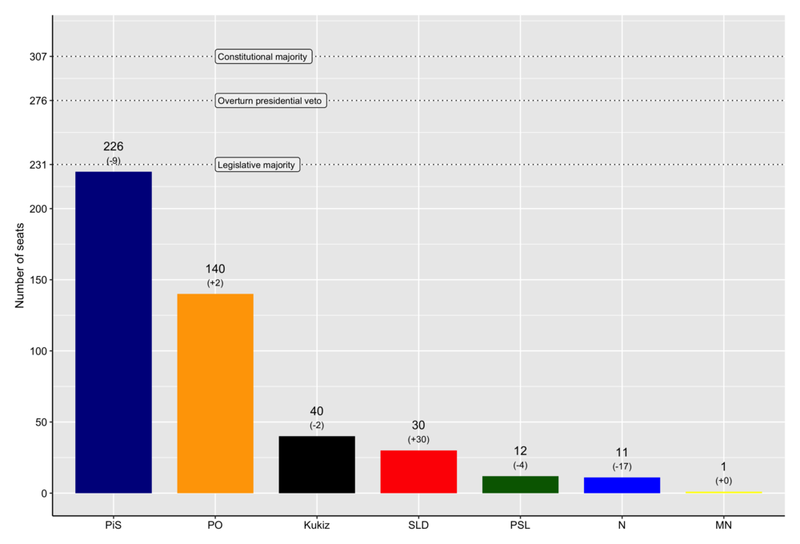 Several subsequent polls have shown PiS losing ground, and PO and SLD gaining slightly. However, CBOS's monthly poll gives PiS 46% of the vote, which is very similar to the figure it has averaged for much of the last six months. A word about CBOS is in order. It is no secret that CBOS polls tend to show higher levels of support for PiS than the average poll does. Typically, this is somewhere between 2pp and 4pp. It is also no secret that CBOS is a foundation financed from the state budget, and supervised by the office of the prime minister. As a result, every time a CBOS poll is published, it attracts a torrent of abuse on social media from opposition supporters who allege pro-government bias. I have no strong opinions either way on this issue, but think it is much more likely that CBOS's face-to-face methods create a "bonus" for the governing party thanks to the phenomenon of social desirability. In any case, the poll-pooling model is intended to mitigate these kinds of biases. The results of the most recent model, run after the CBOS results were released, suggest that the recent fall in support for PiS has bottomed out. However, this may simply be an effect of the latest poll, so I will reserve judgement on that for now. What we can see from the latest poll is that PiS (40%) remains well ahead of its nearest competitor, PO (27%). Indeed, we have to go back at least a year to find a point at which PiS was not at least 10pp ahead. No other party gains more than 10% support, with Kukiz'15 (9%) and SLD (8%) definitely exceeding the 5% threshold for seats in parliament. Nowoczesna (6%) would probably make it into parliament on current polling, while PSL (5%) is as likely to lose out as it is to gain seats. No other parties have a chance of making it into parliament. One recent trend is clear: support for PiS has fallen since the end of February, although it still remains around 40%. PO and SLD have seen slight increases in support during March. However, Nowoczesna continues to perform badly; while in December it had around 10% support, at present it has half this. PSL continues to bump along the electoral threshold, while all other parties are below it. If we assume that constituency-level support for parties is comparable to what it was in the 2015 elections, then PiS comes close to the seats needed for a single-party majority. In this situation, it would likely have little trouble gaining the five seats it would need through transfers from other formations, particularly Kukiz'15 and PSL, and potentially also PO and SLD. It thus seems premature to speak of a "polling crisis" for PiS. As the map below shows, PiS (shade of blue) continues to outperform PO (shades of orange) in the majority of constituencies (the numbers in each constituency correspond to the advantage enjoyed by PiS (in the blue constituencies) or PO (in the orange constituencies). In several areas in the west of Poland where PO was formerly dominant, PiS remains ahead in votes and seats. The party's abrupt decision to return controversial ministerial bonuses and submit a bill to slash legislators' salaries by 20% seems a rather hasty response to a few relatively unfavourable polls.